Great Taste Magazine 2008 Nov/Dec Issue features Chef Scott Raczek and culinary news, tips, recommendations and recipes from Orange County restaurant chefs. Happy Holidays! 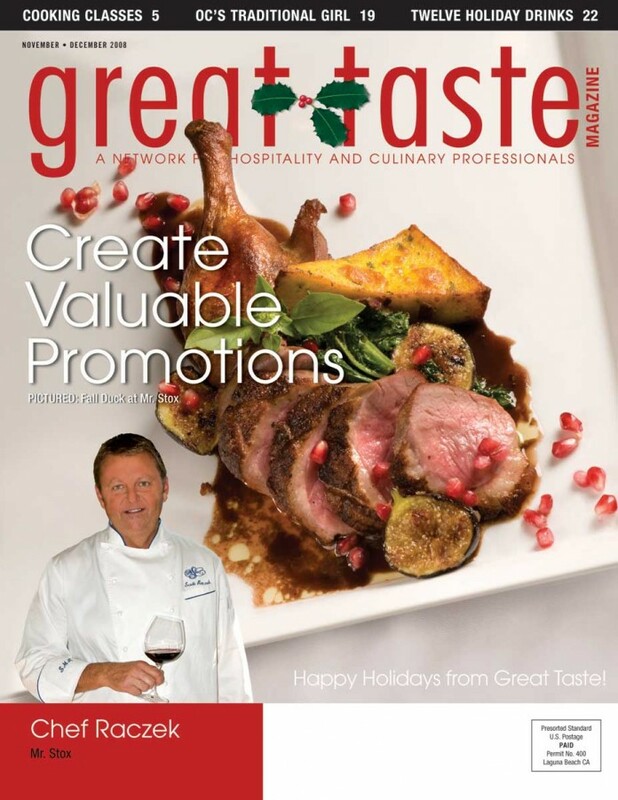 Great Taste is getting into the holiday spirit with some helpful tips and yummy treats. This can be a stressful time for everyone but especially those of us in the restaurant business. Crowds are getting bigger and balancing work with home life can be more stressful than ever. We are here to help with a look at where this stress comes from, how it affects us and those around us and how we can minimize and manage it. This is also a great time to introduce new promotions and capitalize on investments. In our L’entree section Tom Hope, director of culinary at TAPS Fish House and Brewery, offers us a look at how he creates valuable promotions. Tom offers tips on how to create deals that are too good to pass up but still generate a sizeable profit. We also put in a little food for thought about extending happy hours and getting customers more involved, just a little something to consider during this holiday season. Our featured chef this issue is Chef Scott Raczek of Mr. Stox in Anaheim. Chef Raczek explains how he has made Mr. Stox a fixture in the Anaheim restaurant community and why he believes it is essential to be involved in every aspect of the restaurant. For this issue we are also highlighting one other bright spot in the restaurant world, Shannon K Jones, general manager of Scott’s Seafood Restaurant. A true OC girl, Shannon has had an incredible journey at Scott’s from server to general manager and here at Great Taste we feel that’s a story worth sharing. We couldn’t finish this issue without indulging in some of the flavors of the season. Duck is a delicious option for holiday dinners and some of the best duck entrees are right here in Orange County from Fresh Foie Gras at Pascal to Muscovy Duck Breast at White Horses, there is plenty to choose from. Finally we celebrate 12 days of holidays with a special cocktail recipe for each day. Have a pumpkin pie martini on Thanksgiving and a Sparkling Hibiscus on New Year’s, plus 10 more holiday themed creations for everything in between.